Join Kotaku as we showcase some of the best and not-so-best games available for the shiny new iPad. Check out hands-on impressions for Mirror's Edge, Need for Speed: Shift, Geometry Wars, and more! Seeing as I am the only Kotaku editor with an iPad, the process of working my way through the twenty-five or so iPad games now in my possession is a long and arduous one. There's some really good stuff here, and then there's just stuff, and it's my job to separate the stuff from the stuff. Mind you these are quick impressions, which you probably could have figured out on your own, considering this is going live on the iPad's launch day. I'll be updating this post regularly over the next couple of hours, so stay tuned for more, including Scrabble, Plants vs. Zombies, Civilization Revolution, and more! Latest updates: Glyder 2, Parachute Panic HD, and Pocket Legends for iPad. And that's all for now! One man game-playing army needs a nap. The Buzz: It's a fantasy-themed empire-building sim, where you can interactive with hundreds of other players online. Impressions: CastleCraft is a nifty-little city building conquest game that works quite well on the iPad. Since you need to log into a server to play and your game keeps running while you aren't playing, the device's lack of multi-tasking capability doesn't hinder it, and being able to wander off to do other things instead of staring at the screen while the timer counts down how long it takes to build a farm is a definite plus. I haven't had enough time to meet anyone else playing yet, so I couldn't test out CastleCraft's more social features, but if a strong community builds up around it, it could be a real winner for fans of this sort of strategy game. The Buzz: It's the console version of Sid Meier's classic Civilization, redesigned for the iPad. It's essentially the same as the iPhone version, only with better graphics, better controls, a broader view, and a World/Scenario Creator exclusive to the iPad. Impressions: What an interesting way to play Civilization! Revolution was originally designed to be a quick and easy version of Civ for the console generation, but now it feels as if the game were made with the iPad in mind. It's like – yes, I am going to do this – looking through a magic window at your creation, touching things and making them do your bidding. The Scenario Creator is particularly impressive, with several pages' worth of options for you to tweak, from resource density to winning conditions. Just be warned that the game is a bit thick, and not too easy on the newcomer. The Buzz: The iPhone version of Flick Fishing sold more than 1.5 million copies, if that says anything. The HD version includes improved graphics, a Brag system, and two packs worth of add-ons. Impressions: This is a cute little fishing game that's none too complicated. There are several spots to fish, and you'll get requests to catch certain species in specific numbers. Use the casting meter to determine how far you cast out, wait for a fish to bite, and then reel it in with a circular motion on the screen. Simple, inexpensive, and fun, if you're into this sort of thing. The Buzz: Flight Control for the iPhone captured the hearts of more than two million purchasers. Flight Control HD takes the concept and evolves it for the iPad, with larger maps with more room to manuever your planes, eight different single player maps, co-op and split-screen multiplayer, and of course, 3D. Impressions: What a great way to take advantage of the higher screen resolution on the iPad! Rather than simply deliver a larger version of the original game, Flight Control HD gives the player more room to move, so if you need to spiral one of your planes endlessly in a corner while the others land, it's completely doable. You can also draw part of a path, continuing it when you're ready to complete it, making for more strategic depth. This is how games should be upgraded from iPhone to iPad. The Buzz: Such a simple premise, yet so much fun. Galcon, in its various forms, is a game about taking over the universe by numbers. Your planet produces a certain number of ships. Take over neutral planets and hostile planets with superior numbers, while your enemy tries to do the same. It can get rather intense. Impressions: Galcon Fusion takes up the action of Galcon proper several notches, swarms of allies and enemies filling the screen as you try to figure out which resources to allocate to which battle on the fly. It's like real-time strategy, only faster. Hyper-time strategy? For the most fun, try getting into an online multiplayer game with eleven other players. A simple premise that delivers complex fun. The Buzz: If I have to explain the buzz behind Geometry Wars, you might be on the wrong website. Perhaps you were looking for Otaku and typed an extra 'K'? Impressions: One of the best games on Xbox Live arcade could be one of the best games on the iPad. I'm completely in love with the controls of Geometry Wars Touch. You control the game with your thumbs, one for movement and one for fire direction, but instead of using fixed points, wherever your thumb touches, that's your thumbstick. Many iPhone titles have tried this technique, but with the large surface of the iPad, it really sings. The game features several game modes, including Evolved, King, Deadline, and Pacifist, which should be more than enough to keep iPad twitch shooter fans happy. Very well done. The Buzz: One of the most soothing yet involving games on the iPhone just got…soothinger? Glyder and Glyder 2 were very pretty iPhone apps. This is Glyder 2 with prettier graphics, a new control scheme, enhanced navigation, and Facebook connectivity. Impressions: Glyder and Glyder 2 were a pair of games that I always felt were too small. Problem solved. The bigger screen and hi-res textures do indeed make it easier to lose yourself in the simple joy of riding the air currents. The Buzz: This is the iPad version of award-winning physics puzzle game iBlast Moki, redone with enhanced HD graphics. And it's adorable. Impressions: iBlast Moki is another iPad title that benefits from the increased size of the iPad. Positioning the bombs needed to blast the adorable little Moki into their holes is easier than ever. A cute little title that should be loads of fun for fans of physics-based puzzles. The Buzz: The original Mirror's Edge got plenty of buzz, and the iPhone version wasn't looking too shabby either. Now it's bigger, better-looking, and comes with split-screen racing for two players. Impressions: It's a version of Mirror's Edge that won't make you throw up! Set Faith running and use swipe moves with your fingers to make her jump, roll, slide, and climb her way through 14 levels of HD cityscapes. The game looks gorgeous, its stylized graphics translating well onto the iPad's screen, and it handles like a dream. I was not expecting to be impressed by this, but I am. And I've not even had a chance to try out the multiplayer yet. The Buzz: You know that basketball shooting game you find every now and then at the arcade? This is that, or at least the iPad version of the iPhone app of that, with enhanced graphics and a new set of WNBA balls to collect. Impressions: Not being a basketball fan, I've never really played the arcade basketball shooting games, so you're on your own as far as comparison to the real thing goes. It looks lovely, and the basketballs definitely look like basketballs and not say, oranges, but in the end, you're just flicking them towards the hoop. Is that worth $2.99 to you? The Buzz: Need for Speed: Shift was used at the initial iPad press conference to demonstrate the device's gaming acumen. Let's see if the full game, one of the priciest available, lives up to the hype. Impressions: It's no wonder this game was chosen to represent iPad gaming at the press conference. It's a very pretty racing game, packed with 28 cars (8 exclusive), 18 tracks, day and night driving, and local WiFi and Bluetooth multiplayer. It controls rather well, especially when you turn off the automatic acceleration and steering assist. As much as I'd like to speak out against the $14.99 price point, this is one game for the iPad that's worth it. The Buzz: This simple game of landing a parachutist on passing boats was downloaded more than 4 million times in its original iPhone iteration. Impressions: One of the most charming little titles in the iPhone is also one of the most charming bigger titles on the iPad. The premise is simple – land parachuting stick figures on boats, while drawn obstacles try to take them out. The scribble art is cute, the music is quirky and enjoyable, and the whole pad of paper premise works much better on the iPad. Go figure. The Buzz: It's Plants Vs. Zombies, with a touch screen and higher resolution graphics. What more do you need? Impressions: This is perhaps the most fun I've had playing Plants Vs. Zombies. There's just something about having the garden laid out in front of you, your finger hovering, ever-watchful for life-giving sun. It makes the game a bit more personal, and makes the update to this guide a bit slower. Get it. The Buzz: Pocket legends is a free MMORPG for the iPad! Impressions: Yes, Pocket Legends is a MMORPG. Many people can play, and you have a persistent character you can customize from one of three different classes, but there is no real open world here, per se. It's more of a lobby system where you can team up with a couple other players and go on an adventure, and there's nothing wrong with that. It does have all the pieces of an MMO in place – experience points, hot keyed skills, attributes, equipment. It's just a bit more Diablo than EverQuest . That's not to say it's Diablo-quality, mind you. The game still needs a bit of polish, and the graphics are a bit primitive, but a lot of that can be forgiven for the inclusion of the world ‘free' in the price section. The Buzz: Another genre that seems tailor-made for the iPad, Sam and Max Episode 1: Penal zone kicks off a new series in Telltale's beloved dog and bunny police drama. Max, the homicidal rabbit, gets psychic powers. That's all you need to know to want it! Impressions: It's Sam and Max, freelance police! As we join our heroes, they are imprisoned by the vile alien General Skunkape (skun-kah-pay), and have to use Max's new psychic abilities to stop his evil plan. What psychic powers? All will be explained, in due time. The trademark Sam and Max humor is all in place, the graphics are sharp, and Max gets to be a bazooka. Max gets to be a bazooka. I could say that all day. How could I not recommend Sam and Max? The Buzz: This is the one everybody is talking about, potentially an iPad killer app. You all know Scrabble. This is Scrabble that one to four players can play without having to set up a board and divvy out tiles. Impressions: I just played the word ‘IT' against the computer, so you should probably not look to me as an expert in all things Scrabble. Still, this is one impressive game for the iPad. Even without taking the iPhone-connecting Party Play option into consideration, the ability to hop into a game with Facebook friends, via a local network, or just by passing around your iPad makes for a much neater way to play Scrabble that ever before. My only complaint would have to be that I expected the board to be bigger, but then I have freakishly large fingers. We've established that. The Buzz: It's Super Monkey Ball, on a larger screen, with new mini-games, including a game four-players can play on one screen. This is madness. Impressions: Again, it's Super Monkey Ball. The iPad proves to be an adequate tilt controller for our favorite ball-encased monkeys, and the vibrant screen makes the scenery pop just right. Not sure about that regular price though. If you're planning on picking it up, definitely take advantage of the $9.99 early adopter sale. The Buzz: Tap Tap Radiation is Tapulous' attempt to take advantage of the iPad's power, combining the basic premise of Tap Tap Revolution with astounding visuals. Impressions: I'm not sure about astounding visuals. I mean, they are pretty, but astounding? I am not astounded. Instead of a track with tap indicators coming down, Tap Tap Radiation has the indicators flying from off the screen, utilizing the iPad's increased real estate to shift the position of the targets as the music progresses. It's interesting. It's also free, so you can just try it out for yourself. The Buzz: Well, I wouldn't exactly call it buzz, unless you're talking about the Intellivision's audio effects, amirite? No? Okay. Six classic Intellivision titles, recreated for the iPad. Impressions: Intellivision games don't stand the test of time very well. Perhaps the kitsch factor is worth $2.99 to a few, but spending money to play ancient and quite frankly boring titles on a screen this pretty just seems like a waste. The Buzz: A game of space exploration in which you take part in quests, exploring more than 35 star systems and piloting 172 different starships in a bid to dominate the universe. Impressions: I was right to be impressed! This is an expansive little space simulator, reminiscent of a simplified version of one of my favorite old PC games, Privateer. You've got simple combat, quests, mining, commodities brokering, and a faction system. It works particularly well with the iPad, as it makes you feel like you're in the future. The Buzz: The classic worm-battling game comes to the iPad. What, you wanted a long paragraph? Impressions: I'm actually slightly disappointed in the iPad version of Worms. The controls seem a bit off, like I'll have my shot all lined up, hit the button on the screen to fire, and my shot repositions itself, flying harmlessly into the landscape, or harmfully into me. Perhaps I'll like it better once online multiplayer is implemented. Team17 couldn't get it in the launch version, since they only had one iPad to work with. 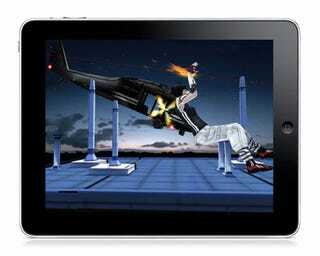 The Buzz: Zen Bound 2 was probably the first iPad game we saw screens of after the initial press conference. It's all about wrapping wooden figures with string. In other words, it's one of those relaxing games. Impressions: Well it certainly is relaxing. If you're looking for a game that won't piss off the folks down at Starbucks with gratuitous violence or harsh noises, then Zen Bound 2 is the game for you. It makes great use of the iPad's graphical capabilities; it could be considered a showcase title. Ghost Monkey's music will lull you into a calm place you didn't know existed, and there's something soothing about wrapping things with string. Do not play when sleepy.